August 6 marks Cefalu’s annual celebration of their patron saint, Santissimo Salvatore della Trasfigurazione (also known as Christ Pantocrator). The tradition stems from the UNESCO recognized cathedral, or duomo. 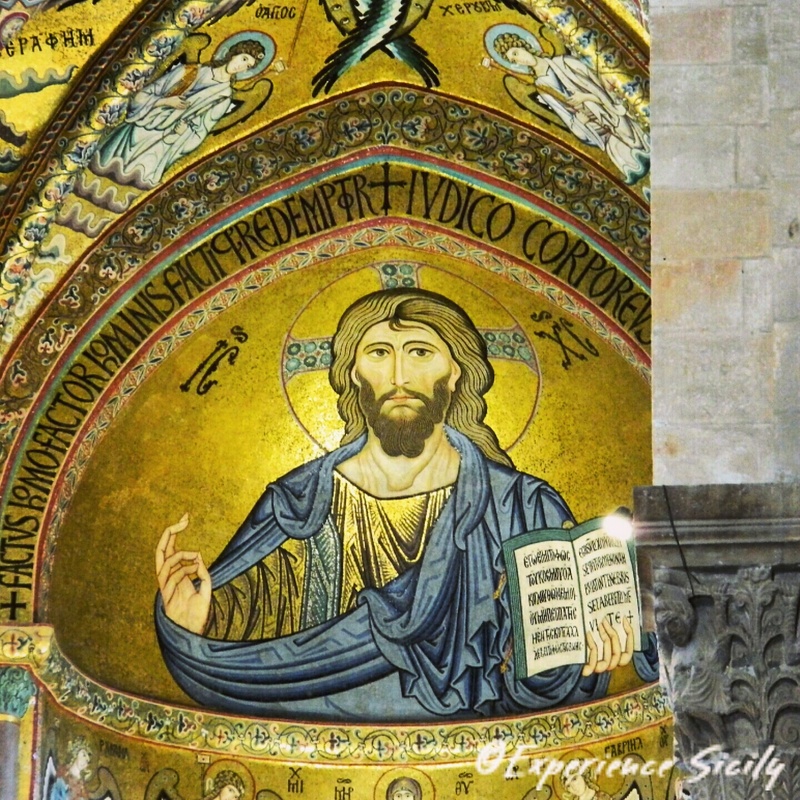 Boasting a remarkable Byzantine-style mosaic of Christ Pantocrator (pictured), the cathedral was commissioned in 1131 by the visionary Norman King Roger II after his ship found refuge on this spot during a harrowing storm. The feast on August 6 is celebrated with a procession, fireworks, and the traditional pole (or ‘ntinna) game (Think telephone pole.). During the afternoon, the ‘ntinna is slathered with animal fat and soap and staked horizontally in Cefalù’s ancient port. A flag imprinted with the image of Jesus is flown at the top of the pole. The object of the ‘ntinna game is climb “up” the pole to capture the flag before your competitors do. Competitors dress in costumes and approach the contest with humor. Of course, there is a referee of sorts who pulls and manipulates the pole to make capturing the flag more difficult for the players. Observing the ‘ntinna game is the real fun! At 8:00 PM, all eyes turn to the duomo from where the town’s confraternities carry upon their shoulders the statue representing Santissimo Salvatore della Trasfigurazione toward the pier. Accompanied by musicians, the priest leads devotees through Cefalù’s medieval streets without the use of candles lighting the way, which strays from traditional practice in most other Sicilian towns. Once at the pier, the priest blesses the sea. The procession returns to the cathedral where a prayer is led, followed by applause. Previous Post When is the Best Time to Visit Sicily?